The speed given is the read speed. USB 2.0 maxes out at about 30mbs, so faster cards would only be beneficial is your computer has USB 3 ports. It’s logical that a card with fast read speeds, such as 95mbs, would write fast, but that number doesn’t relate to the actual write speed. What you mention about USB 2.0 running at 30mb/s max is only true for downloading images from the card. The D7100 camera is capable to write speeds up to to 99mb/s. Using a slower card only capable of 30mb/s write speed will affect burst performance because the buffer will not clear as quickly. The Sandisk cards listed read 95mb/s are quoted by SanDisk to support write of 90mb/s. 2) Is having two 16GB cards equivalent to having one 32GB? (assuming the speed ratings are all same – UHS-1/95MB/s)? On the Lexar card, 150MB/s is the read speed only. The write speed is what matters and it is about half of the read speed. It’s a decent card and has a faster write speed than the 633x Lexar card. The 95MB/s rating on the 633x card is also a read speed only, and write speed is about 40MB/s. The capacity does not matter. I am looking to upgrade my card for D7100. I have seen that Lexar 600X is one of the recommended options . 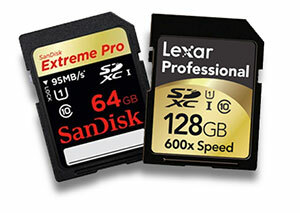 Apparently the Lexar 600X is now discontinued and replaced by “Lexar Professional 633x 64GB SDXC UHS-I/U3 Card”. I wish to know if this is supported by D7100 camera. Yes, the Lexar 633x is supported by the camera. purchased the Polaroid SDXC UHS-1 card and it is working in the D7000 and the D7100. Trying to get the wifi transfere function working and can’t find any kind of info to get it setup. The Polaroid number is B01H49U1VW.